Panning is the technique which shows the motion of the subject, if done correctly. It involves the movement of the camera along with the moving subject either in horizontal or vertical direction. When we think of horizontal panning, we can think of situations like traffic on the road, racing games, sprinters or cyclists, whereas panning to capture the motion of a diver is an example of vertical panning. Theoretically, panning is a simple technique which requires you to use the slower shutter speed, maintain the focus on the subject, continuously pan with the subject and then take the shot. But getting a perfect panning shot is not as simple as it sounds. It needs precise focusing on the subject, good timing on releasing the shutter, balancing your distance with the subject and keep practicing with the different shutter speed until you get the balanced result. Panning is an interesting concept where the motion is shown by freezing the movement of the subject while making the background blurry at the same time. We all know that freezing the moving subject requires faster shutter speed, but to make the part of the image blurry, we need to shoot with the slower shutter speed. If that is the case, you can possibly argue that how can we achieve the desired shot without combining multiple images, right? And that is the secret of this technique. You don’t have to edit the picture or combine shots in order to get the motion effect in a single picture. You would get it by properly applying the techniques, and timing the shot from the proper distance so that you could include the background in the frame, which is very important to get the motion effect. Now let’s get into the details of these techniques and see how can we master the panning shots. When I saw the first image with silky water effect, I thought it was some skillful task accomplished using Photoshop rather than something produced on the camera itself. I was just getting into photography and didn't have much knowledge about various types of photography. After I got my first DSLR, Nikon D60, I started learning the basics of photography; Shutter Speed, ISO, Aperture and was enjoying whatever I could shoot. Actually for the first few months, my expensive DSLR was just a point and shoot camera in Auto Mode. It was only after I learned about various shooting modes and how it works in different light condition, I got interested to dial into them and experiment with the subjects and (objects). Soon after, I upgraded my DSLR after realizing the limitations and the features that my camera offered. When I bought Nikon D90, I started using external flash units, configured them into remote flash units into group using built-in commander mode and learned other advanced camera settings. Everything was working great but knowing more about different DSLRs and what could it offer enticed me to upgrade myself to my first full frame DSLR, Nikon D700. It was probably one of the best camera I ever owned. It never failed me and always exceeded my expectations. I learned so much about long exposure shots, variety of landscape shots using combination of full frame sensor and wide angle lens and many more other small but very useful photographic techniques. 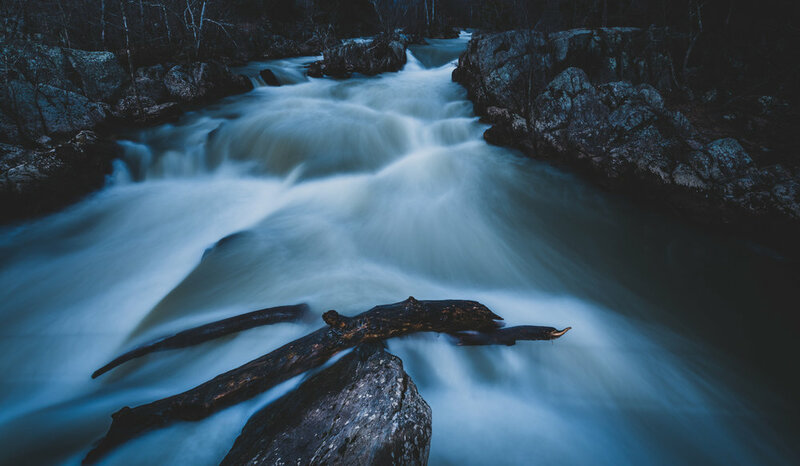 I also learned that the very first silky water image I saw was not any tricks done using Photoshop but the long exposure shot done very carefully by using the combination of camera, wide angle lens, filters and tripod. After learning about the technique, I went to the nearby falls in Washington DC Metro area to test my knowledge. It was a fail! I learned a very important lesson and that is reading about the technique and actually doing it in practice are two different things. There are so many variables that could contribute to the final image. Our gears and it's setup is what we can control but the ambient, finding good vantage point and getting the right composition is equally important. After many attempts in nearby small water streams, I gained my confidence and went to the Great falls park in Potomac, Maryland last year only to find out that the bridge that I had to cross to get to the fall was closed due to the construction. As soon as the construction was completed and the bridge was opened, I went to the park last Monday (on the Presidents day) and got the shot below. Let me explain in details about how I got this shot. When I went there, I tried composing and taking shots on my phone from different angle. Once I found my angle, I setup my camera on the tripod and took one shot. I was shooting in Aperture priority (A) mode at f/11 and since it was a bright daylight time, camera automatically bumped the shutter speed up to compensate the light and froze the water motion. I wanted smooth running (silky water) effect and the only way to get that effect at that time was by using the filter. I attached ND 3 filter (which is 10 stops filter letting in only 1/1000th of the light and requiring 1000 times longer shutter speed to get the same exposure as without the filter) and then the shutter speed got reduced to 6 seconds with an Aperture being fixed of course. After I got home, I exported it to the Lightroom and adjusted the exposure and the color tones little bit. This is one of the main reason I started shooting in RAW mode which gives you an option to adjust settings later on the computer that you missed on site. I hope you like my post and if you have any questions or suggestions, please comment them below. I have had Nikon D700 for more than five years and loved every bit of it. When it was time for an upgrade, I was looking for a camera with a similar kind of body and controls. After doing much research, I ended up buying Nikon D810 even though Nikon had just announced D850 to upgrade D810. Before getting D810, I was struggling between D750 and D810 but my decision was made easy once I got my hands on both cameras. Even though D750 is newer model than D810, same look and feel and control as my trusted D700 sold me to D810. Some argue that D750 has better dynamic range than D180 but when I was happy shooting with even D700, I was pretty sure that D810 wouldn't disappoint me and it didn't. After I got my camera, I took it to the New York trip this December and got few shots of New York City and some of the city skyline. After I downloaded the pictures on my computer, I was amazed by the dynamic range of this camera and the details it captured. One of my favorite shot from this trip was mid-town New York City view from my hotel room. After having dinner, when I came back to the room, it was already dark and the town was glowing with the city lights. The city view from my room looked amazing and I was excited to capture it. When I took the test shot, I saw some reflections during the playback on the camera LCD screen. I had no choice but to wait little more so that the lights from neighboring rooms and other hotels will start fading and then try another shot. After waiting for few hours, I closed all the lights in my room and increase the camera distance to the glass window so that the camera reflection on the window wouldn't show up on the picture. Whatever I did at that time to cut down the lights and avoid reflection, it worked and the picture came out with every possible detail I was expecting from 36 Mega-Pixel full frame camera. When I zoomed the picture to 100%, I could even see a person inside distant hotel room. The clarity of the camera sensor is amazing, I love the dynamic range and every detail was visible in the picture. I used Nikon 16-35mm f/4 wide angle lens with the D810 and processed the image using Adobe Lightroom. Please let me know what do you think of this picture and if you are also shooting with D810, please share your experience with this camera. I always appreciate your feedback or any comments you may have. Happy Shooting! After setting up the camera on the tripod, I measured the correct exposure (in a Manual Mode) before using a filter and took a shot. I used the widest possible focal length (which is 16mm on this lens) and chose the minimum ISO possible to avoid any digital noise. And since it was a sunny bright day, I didn't need a higher ISO anyway. I turned off the VR on the lens (really don't need when you are shooting on a tripod), selected an aperture value of f/11 and manually focused the lens to the infinity to get everything in focus through out the frame. With an aperture value of f/11 and ISO 100, camera meter gave me the correct exposure with the shutter speed of 1/8th of a second. Here is the first shot with those camera settings. Then, I applied a 10-stop ND filter on the lens and calculated the required shutter speed (using an app on the left side) to compensate the lights blocked by the filter. Since I left the ISO and the aperture values same, Exposure Calculator App gave me the shutter speed of 128 seconds as the right shutter speed to get the correct exposure. Most of the modern DSLR supports the shutter speed of up-to 30 seconds and if you need more than that, you have to dial into the BULB mode and open or close the shutter manually by pressing the shutter release button. But the cool thing about this app is that it gives you a stopwatch (at the right bottom corner) after you calculate the new shutter speed. When you are ready to take a shot, you can snap the shutter release button (with the shutter release cable) and then start the timer on the app at the same time. And when your timer goes to the Zero, you can release the shutter as well by releasing the button on the shutter release cable. When I took the second shot, I noticed that the shot was little bit underexposed. Then I took another shot without changing any settings but kept the shutter open for an additional 5 seconds than the app suggested. If you are shooting in a RAW, little bit underexposed image is far better than the overexposed because it is easier to bring the details from the shadow than from the blown out highlights during the post processing. 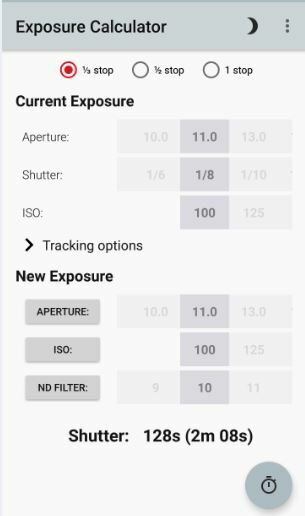 The reason I got the underexposed image with the calculated time could be due to the changing light during the long exposure time or the filter coating variation or the programming on the app itself. Normally, I take the value given by an app as a base value and then play around few seconds left and right while monitoring the histogram chart on the LCD monitor until I get the correct exposure. Here is the second shot with the long exposure setting (notice the leaves movement and the person in a picture below which are the distractions). May be due to the amount of the water flowing in the creek and the current of the water, long exposure didn't produce very much dramatic effect that I was hoping for but there is some noticeable effect on the water due to the longer shutter speed. Some people prefer the first version with a shorter shutter speed and some prefer the second version. I am not sure which side of the aisle you are on but it doesn't hurt to try something new and out of the ordinary as long as you enjoy doing it. What Do The Numbers Printed On Your ND Filter Tell You About The Filter?